Mendelson's Memos: Review: The Raid: Redemption (2012) plays both sides, crafting non-stop action while creating sympathy through unrelenting fear. 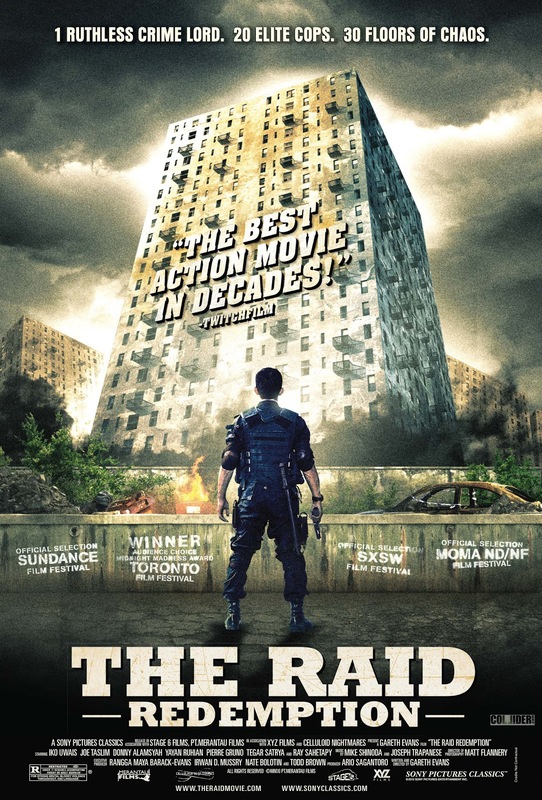 Review: The Raid: Redemption (2012) plays both sides, crafting non-stop action while creating sympathy through unrelenting fear. It would be easy to write off The Raid: Redemption as merely a coldly mechanical genre exercise. Much of the film is basically one brutally violent action sequence after another, with only a bare minimum of plot and character to keep our rooting interest. That the action sequences are generally superb may not negate the fact that the film comes close to feeling less like a feature and more like a glorified demo reel for second-unit choreography. But writer/director Gareth Evans's film elicits a most unexpected reaction from the audience, one that allows us to take a rooting interest in those doing the killing and those being killed. Put simply, The Raid: Redemption is a genuinely scary film. The characters may be thin, and the majority of the plot is explained in the first ten minutes. But the film so viciously establishes the stakes that it is often more terrifying than exciting. The plot is painfully simple. Several police officers conduct a siege of a large apartment building owned and operated by a major crime lord. But said kingpin is prepared, and a few false steps leads to a tidal-wave of heavily-armed assailants set on removing the 'infestation' from the building. As the desperate and out-numbered cops make their way up and down the various floors of the building, the intensity builds and their numbers decrease as the hallways fill with blood from both sides. The picture is fashioned less like a stereotypical action film and more like a relentless horror picture. And just as the best horror films have the audience generally rooting against that which we came to see (the violence and terror associated with the horror genre), The Raid so effectively establishes its scenario that it elicits a genuine fear of the very thing it's filled with. The action may be 'cool' and well-staged, but the characters who partake in it, both cop and criminal, are often scared shitless. We see young out-of-their depth rookie cops coming face-to-face with likely violent death, and we see them sweat. And the 'bad guys' are often just as nervous as they load their pistols and relentlessly attack out of self-preservation. The action has a certain realism to it, not just because it is realistically graphic, but because the participants are every bit as desperate and afraid as you or I might be in such a situation. There are several sustained hand-to-hand combat sequences, and they all elicit genuine dread as the cops just have to keep fighting one nameless foe after another, knowing full well that if they lose they will die. This is not action about proving one's courage or 'manhood', but merely about not being the loser. Since we are immediately placed in their sympathetic shoes, we don't thrill to the action beats so much as dread them. The picture is still a bit thin in regards to character, and it drags just a bit in its final act. But the film earns points for refusing to be merely a technical exercise. That empathy, that genuine desire to see these luckless cops make it out of the building alive, is what makes The Raid: Redemption more than just a glorified (stereotypical) video-game. Yes the action is varied and impressive, staged and edited for maximum clarity and coherence. But the key to the film's impact is that Evans places us in the shoes of the protagonists. We spend the film not cheering for 'awesome' action sequences, but hoping that confrontations won't occur and that these cops will survive to fight another day. The Raid: Redemption is a rarity: an action film that emphasizes not excitement but fear and dread.